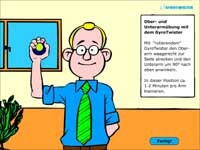 Here you can download software products for your Gyrotwister. Your GyroTwister performs 10,000 rotations per minute. That's what the instructions say. How many YOU really can achieve is not mentioned. That's what the GyroMeter® is for - letting you exactly know what your performance is. We asked an expert for signal processing and vibration technology to develop a software for us. 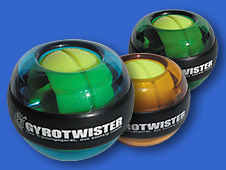 By analyzing the GyroTwister sounds, a specially-programmed algorithm can determine the number of rotations. All you need is a sound card and microphone. Once active, just hold your GyroTwister close to the microphone and our software will indicate the current number of rotations, the strength index and the high score. Additionally, the GyroMeter® helps you prove whether others who claim to hit over 10,000 rotations per minute really do so. Test it to the limit! We wish you much enjoyment in competition. The GyroMeter® measures rotations higher than 3,500 per minute. Any thing less will not register. This shouldn't be a problem since true GyroTwister experts are much better than this. The software is completely free of charge and you can use it as much and as often as you want. Click here and get the free GyroMeter®! Please enter your e-mail address and click the button. The download will start automatically. Yea, please keep me informed by email about product-news and special promotions. Are you always tense when working on the computer? Do you experience tingling in your hands or arms? Do you often feel stressed and don't have time for long relaxation breaks? The Breaktimer® is the ideal partner for the GyroTwister. By taking short 30-60 minute relaxation breaks, you won't lose any time. You'll actually gain time because you'll be able to work with more concentration than before. Try and see - IT'S WORTH IT. "The employer is obligated to organize employee tasks so that the daily work on computer screens are regularly interrupted by breaks or other activities in order to reduce the stress of working with screen devices..."
For years now, medical experts have recommended taking breaks, because the negative effects of modern office workplaces on the health of individuals, company productivity and the economy as a whole are well known! Taking regular, short breaks help improve performance and improve concentration ability. Regular fitness training promotes health, prevents illness and helps combat pain (back, neck, etc.). Training with the GyroTwister BREAKTIMER® is not only recommended for health reasons, but is also fun. This has a positive effect on motivation and on user's readiness to perform. The GyroTwister BREAKTIMER® promotes health, motivation and performance ability of your employees and increases their satisfaction and productivity. The GyroTwister BREAKTIMER® SOFTWARE IS A GAIN FOR YOUR COMPANY! The software is completely free and you can use it as long and as often as you want. Click here for the free GyroTwister-BREAKTIMER®!